My favorite thing about Japan is the limited edition everything! And what's great about summertime is the abundance of summer flavors. When you combine that with a staple of summer in Japan, outdoor drinking, you get something marvelous. 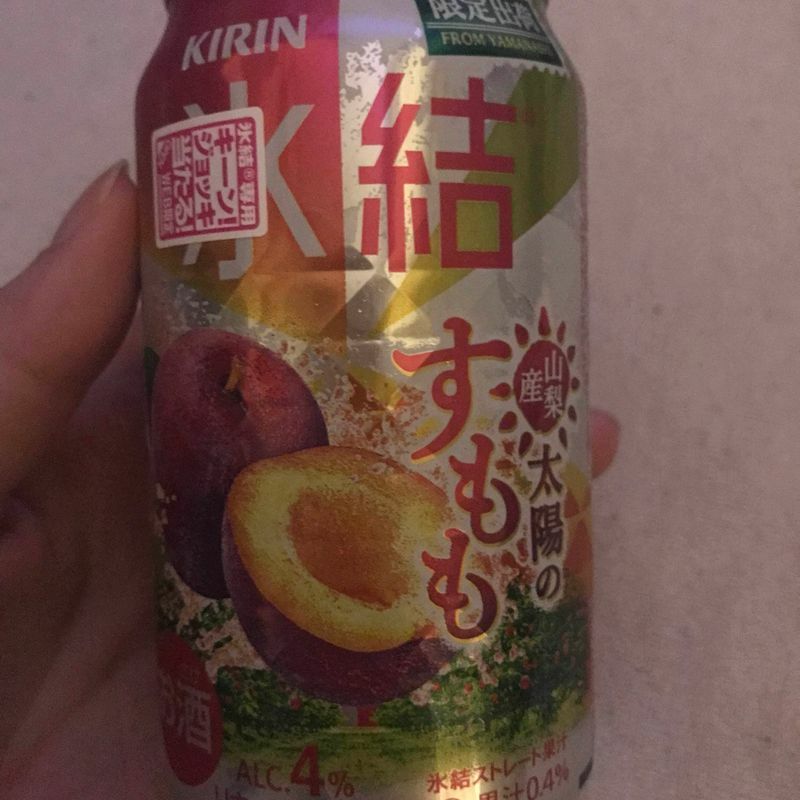 Today, I'm talking about a plum chu-hi made by Kirin brand. Kirin, most commonly known internationally for their beers, makes a lot of things. One of those are chu-hi. Generally, their flavors are good and the alcohol content can be anywhere from 4% to 9% depending on which you buy. For me personally though, my favorite is Suntory's Horoyoi. They are always putting out new and delicious limited edition flavors. The alcohol content on them is a lot lower (in the range of 3%) but they taste a lot sweeter and have a truer to advertised flavor. This is why I was so curious about Kirin's new Yamanashi plum offering. If the delicious flavor of plum doesn't wrangle you in, that can has got to do something for you! I mean, look at it! You can just feel summer calling out from every inch of that label. This particular flavor contains 4% alcohol, which is a bit lower than what I'm used to when dealing with Kirin's chu-hi. However, I think this is what gave it such a strong flavor. Like I said before, when the alcohol content is lower (read this as: when you can't taste the alcohol as strongly), the more you can taste the juicy flavor. (Again, which is what makes Horoyoi so good.) So, with 4%, it was more plum than shochu flavor. Plus, these were special plums. They were Yamanashi prefecture's delicious plums! (Actually, I'm not really sure if Yamanashi is famous for plums... I know they're famous for grapes because of the wine country, but plums?) However, I wasn't complaining. Honestly, I hope that Kirin decides to make a specific chu-hi flavor for each prefecture. How cool would that be?! When you first crack open the can, you get assaulted by the smell of plums. Honestly, it was a little much for me and it did smell a bit artificial. However, I didn't let that influence my judgement and I went in for the first sip. And then another, and another. I couldn't get enough. Seriously, it's that good. The flavor is a bit sweet, but aren't all chu-hi flavors? But the flavor of the plum was spot on. I'll admit that it did taste a bit artificial as well, but it was addicting in a way. It was fruity but not sickly so. It was toeing the line but it never crossed over, no matter how much of it I drank. I ten out of ten recommend that you buy this up if you can. I know I'll be heading to the convenience store again in the near future to pick up more while I can... It's a limited flavor, you know, and you'll never know when it'll be gone one day for good.